Travis, Travis, how do I love thee...even more now that I have read Walking Disaster one of my favorite love stories told through Travis's POV...LOVED IT!!!! Jamie McGuire is a brave woman. This was a gamble and happily one that paid off. After reading Beautiful Disaster everyone wanted to hear the story from Travis's side. As one of my very favorite books this could have gone very very badly but Jamie pulled it off. Although a bit disjointed this absolutely let us feel Travis..his pain, his confusion, his hurt...I was in tears for the guy. My heart actually ached and I wanted to share his bottle of JB with him. JM has such a talent for creating characters that are so fully diamensional that you can't help but feel you are in their skin or at least be their confidant. I won't comment on the plot or story line because I said it all in Beautiful Disaster other than I have to say the read was worth it for the epilogue alone. I hope Jamie gives us more of the Maddox family I would love to read about Thomas and his FBI work and hear Trenton and Cami's story. I will be attending a Question/Answer chat with her this month so it is a question I am dying to ask. Regardless of what she writes I know it will be wonderful and hope the wait is short. Well done Jamie McGuire..now I have to go read BD and WD side by side..which I think will be wonderful!!! 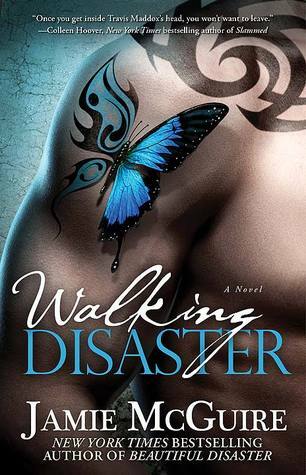 4.5 stars for this fantastic companion book to Beautiful Disaster. I must mention the beautiful cover as well...loved it.A short warning you do need to read BD prior to this book to understand all the nuances and plot development. READ RATE REVIEW...lets hear your opinion!